A Few Paragraphs: Edison: History's greatest humanitarian! It's little known today but famous inventor Thomas Edison was actually the greatest humanitarian who ever lived. Sure, we're all used to hearing of Edison the jerk, Edison the man who battled Westinghouse up one side and down the other to block much more efficient Alternating Current, Edison who crushed the dreams and buried the vision of Nikola Tesla, Edison the elephant electrocuter, Edison the... well, you get the picture. But when you weigh all that against his magnificent invention of 1878, it's no contest. Edison ranks right up there with Mother Teresa and the entire Doctors Without Boarders organization. Because Thomas Edison, with a single stroke, eliminated hunger from the Earth. One day, Edison was riding through the streets of New York in his gold-plated carriage with J P Morgan, John D. Rockefeller, and several Rothschilds discussing how there were simply too many ragged street urchins clinging to their vehicle begging for money. The Great Inventor took the opportunity to demonstrate one of his latest inventions, running 50,000 volts through the skin of the carriage, thereby efficiently dislodging the grubby, starving children. As they watched smoldering little beggers dropping like over-ripe fruit into the street, Edison commented triumphantly, "I call that my 'Poverty Eliminator.'" The Plutocrats chuckled and drove on. Later, as they sat down to a posh but impromptu dinner at Edison's home, one of his butlers sheepishly informed him that there weren't enough Delmonico steaks to go around. "What?! Not enough steak?? I'll soon fix that!" 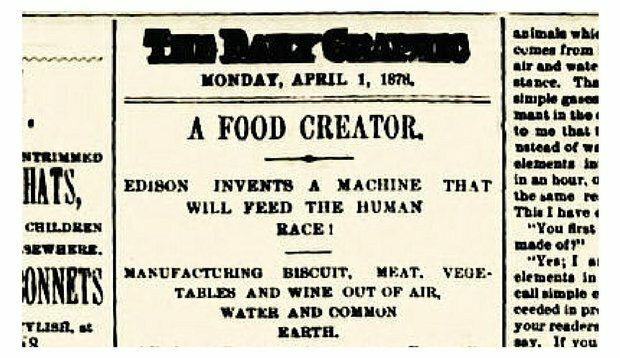 When Edison returned from his basement lab 2 hours later the wondering tycoons stared in amazement at his "Food Creator," a portable, easy-to-use device capable of transmuting any type of matter into any food imaginable. Huzzah! A new age dawns! For more information about this wonder, click on the headline!